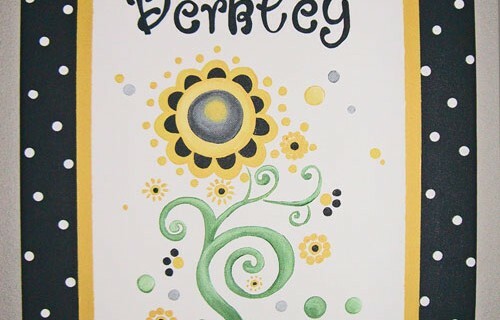 Looking for inspiration for artwork for your little one’s room? Sometimes, you can find that inspiration from a fabric swatch. 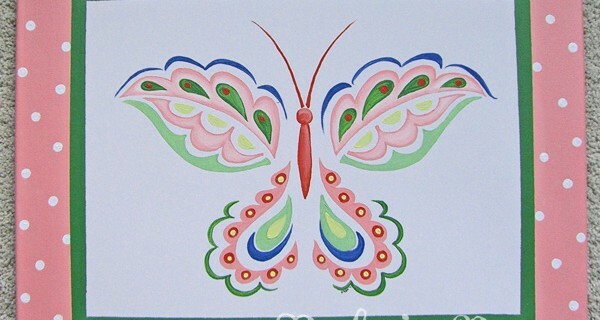 Like this one: For these paintings, we played off the paisley pattern in the fabric swatch to create a unique butterfly and flower pattern. And the end result? One of the best things about doing paintings for expectant parents? I get to find out the name of their little darlings before most people. The downside? I have to wait until the baby arrives to post pictures of their paintings. Good thing I love me a secret! 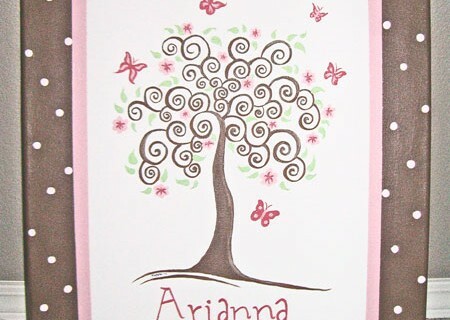 Welcome to the world, baby Arianna! Big sister Libby gained a new baby sister as well as a new roommate, Arabella. Their room was decorated in a butterfly theme, with walls of soft yellow and accent colors of pink, lime green and orange. We did matching butterfly prints for their new room to coordinate with the new decor.